Stephen King has won America’s prestigious National Book Award and was voted Grand Master in the 2007 Edgar Allen Poe awards. 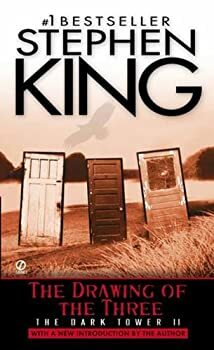 He lives with his wife, novelist Tabitha King, in Maine, USA.There are synopses and audiobook excerpts of The Dark Tower novels at Stephen King’s website. CLICK HERE FOR MORE BOOKS BY STEPHEN KING. 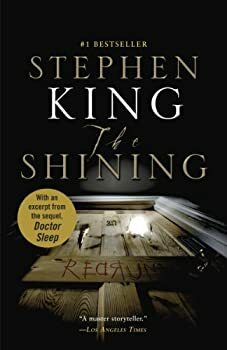 Stephen King’s The Shining is an amazing character study that drives mood-heavy, emotionally deep, and unrelenting literary horror. The story centers on Danny Torrance, a young boy with a unique ability, termed the 'shine.' Danny can sense the future, and communicate mentally and emotionally with his inner self and other people, alive, and sometimes less so. Stephen King writes ‘childhood’ masterfully. He's able to tap into the emotions of youth, and create evocative realism in their thoughts, dialogue and action. 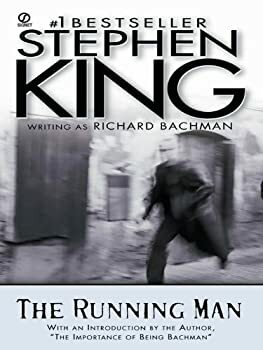 Also found in his magnum opus It, King places children in extraordinary circumstances; yet still creates very realistic, thoughtful and down-to-earth reactions and behavior. I’ve avoided some of Stephen King’s more recent works, like Cell and Under the Dome, because they didn’t look like they would be my thing. Doctor Sleep was a different matter. 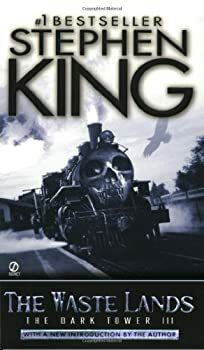 I didn’t think it was perfect, but it had a lot of the things I look for in a King novel. Stephen King’s The Gunslinger is a post-apocalyptic Western-fantasy hybrid about the gunslinger Roland Deschain and his pursuit of the man in black across a desert. 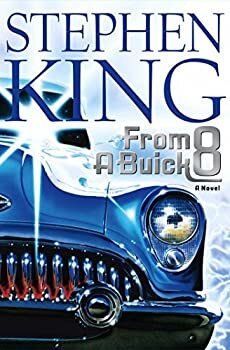 There is a lot to be said in praise of Stephen King, but one of his most admirable talents is his ability to vest his heroes with such unlikely and frustrating vulnerabilities. 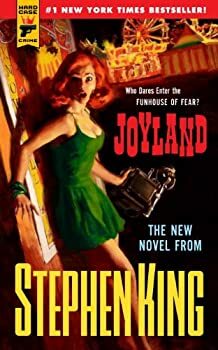 King certainly wastes no time castrating the recently victorious Roland Deschain in The Drawing of the Three, the second of Stephen King’s The Dark Tower novels. We barely have time to blink at the mountains and the ocean before we find Roland, the last gunslinger in Mid-World, under attack from “lobstrosities.” Though he survives, Roland loses an index and middle finger to these sea monsters, a significant loss for our pistol-bearing hero. The wounds fester as Roland doggedly continues his journey, and he eventually finds three doors that carry him to New York. The Waste Lands: What Kind of Knights Are These? The Gunslinger introduces us to Roland Deschain, the last cowboy-knight of a world that has moved on. In The Drawing of the Three, King gives Roland partners. The Waste Lands, the third novel of Stephen King’s The Dark Tower novels, focuses on fleshing out the details of Roland’s quest. But not too many details. It turns out that a Crimson King is doing everything in his power to destroy the universe from atop the Dark Tower. 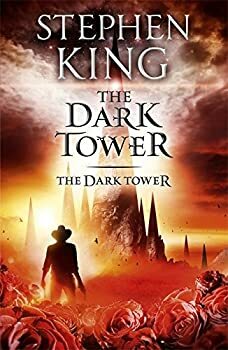 After centuries of searching, Roland has begun to make real progress in his quest to find the Dark Tower because he and his heroes have come across one of the beams that control the world. Like most of King’s creations, it reads better in the book than in summary. The Wizard and the Glass, the fourth of Stephen King’s The Dark Tower novels, returns to the Mid-World of Roland’s youth. Having recently bested his teacher in combat, Roland is now a gunslinger, one of the cowboy-knights of Gilead. However, Roland is young, and his father sends him away from his court — and away from the villainous sorcerer Marten Broadcloak. With his two companions — clever Cuthbert and the steady, cerebral Alain — by his side, what’s the worst that can happen? 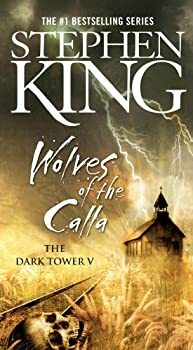 In Wolves of the Calla, the fifth novel in Stephen King’s The Dark Tower series, Roland and his posse defend a village from monsters. King borrows the great ideas of a variety of favorite stories, yet his final product is ultimately less than the sum of its parts. Calla is a farming village preyed upon by the Wolves of the Thunderclap. The Wolves come once per generation, take children, and return them “roont,” mentally handicapped and destined to grow gigantic before dying young. Should the village continue to live with this curse, or should they stand and fight? Enter Roland and his band of gunslingers, the last of Mid-World’s heroes. In his famous series, The Dark Tower, Stephen King has so far divided his time between assembling a posse of unlikely gunslingers and paying homage to his literary heroes like Tolkien and Sergio Leone. 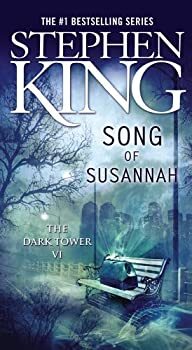 In Song of Susannah, King shifts gears and instead begins to wrap up Roland’s quest to find the Dark Tower. The Dark Tower: Does the destination justify the journey? Stephen King’s concluding volume of The Dark Tower series, The Dark Tower, is nothing if not surprising. 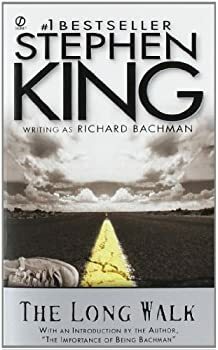 Since its release, fans have squabbled over whether King hits a homerun or hits the ditch in the final volume of what has been described as his masterwork. Without giving away the ending, I think the resolution of The Dark Tower is fantastic. Stephen King’s latest, The Wind Through the Keyhole, is a DARK TOWER novel. 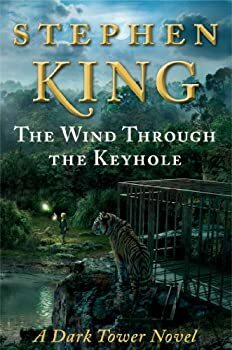 The cover assures readers that they can read this novel even if they have not read the rest of the series, which is probably true, but the already converted will be interested to know that The Wind Through the Keyhole is something like the 4.5th book in the series. While King may not (cannot?) offer any revelations here that will significantly alter the course of the series, he does offer readers another chance to join Roland and his posse of gunslingers as they make their way toward the Dark Tower. 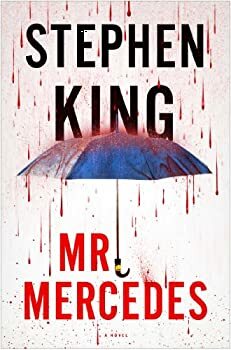 Stephen King stays away from the supernatural and explores a more Earth-bound and human-centric kind of horror in Mr. Mercedes, the first in a trilogy, which will conclude with the spring 2016 release of End of Watch. The story hits upon a type of tragedy that’s made real-world headlines in the last few years: an out of control car (naturally, a Mercedes) mows down pedestrians standing in a group, caught by surprise, and without any chance of escape. While many of these real-life incidents appear accidental, the deaths in King’s story are quite intentional and murderous. 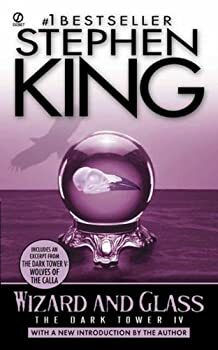 Starting in 2012/2013 I started obsessing on Stephen King. I'm slowly working my way through his catalog, which means I should have a pretty full life of King left to me, right? I'm a huge fan of It, The Stand, The Shining, and I actually really enjoyed Under the Dome. I wanted more, and so I’ve gone old school with Salem's Lot. Stephen King's The Stand is an awesomely epic creation. It's good versus evil writ large across the American landscape. It's heavy, detailed, and extremely rich in the characterizations of its people and themes. The story is familiar — an apocalyptic virus is accidentally (and inevitably) released from a government lab. Over 99% of all human life is wiped out by what becomes known as Captain Trips. This story is about those who survived. The survivors are polarized around two god-like characters that magnetize individuals through their dreams. Mother Abigail Freemantle, a 108-year-old woman from Hemingford, Nebraska draws those with inherent goodness. Randall Flagg, from nowhere and everywhere, draws those with a slightly more dubious nature. Ray Garraty, Maine’s own, lives in a near-future dystopian America where boys enter an annual game, the Long Walk, in which the winner is given anything he wants. The winning boy must walk at four miles per hour longer than any other boy in the competition. Boys whose pace drops below four miles per hour are given a warning, which they can lose after an hour of at-pace walking. Boys that collect three warnings, however, receive their “ticket,” a bullet. The Running Man: Don’t read the introduction! Ben Richards hates America’s dystopian future. Because he quit his job cleaning up atomic waste before it could sterilize him, Ben finds himself blacklisted and unemployable. He and his wife, Sheila, did manage to conceive, but their daughter now suffers from pneumonia in polluted Co-Op City. Sheila makes ends meet by turning tricks, which bothers Ben. 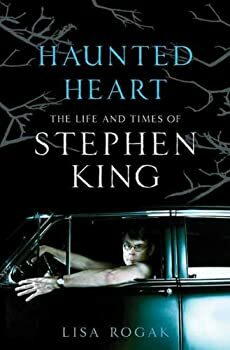 Stephen King's It is a wonderfully sweeping tale of what it means to be a child and what it means to leave your childhood behind, inevitably and mostly forgotten, when transforming into an adult. 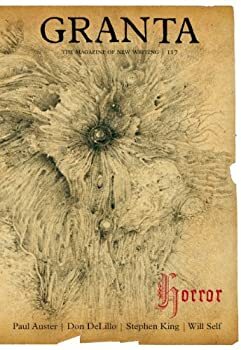 This very evocative tale of childhood orbits and surrounds a tale of exquisite horror, and is my favorite of the 25 or so King books I’ve read. My whole pleasant life has been nothing but the eye of some storm I don't understand. For the most part, being sheriff of Castle Rock, Maine is a peaceful job — that’s what Sheriff Alan Pangborn tells himself on difficult days. And for the most part, Alan’s right. Castle Rock is indeed a peaceful little town. Sure, there are frictions. The Catholics are planning to have a Casino Nite, which angers the Baptists. Wilma Jerzyck thinks she knows best, and she isn’t afraid to bully anyone in the town until they accept her way. And everyone knows that Buster Keeton abuses his authority as the town’s selectman. Still, one day in Castle Rock mostly leads into the next without incident. My only disappointment in Stephen King’s Desperation is that it isn't longer. 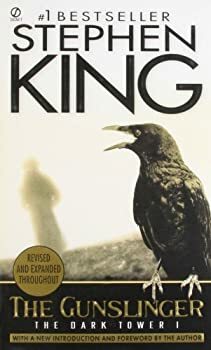 This book contains all that makes King so enjoyable to read: strong and believable character development; intuitive and subtle understanding of the childhood psyche; horror as defined by what's creepy, intense, psychological and sometimes gothic; mythological back-story that superbly connects past and present; and the believably supernatural. Several travelers, mostly strangers to each other, are abducted by a seemingly deranged Sherriff and taken to the dusty Nevada town of Desperation. Mayhem ensues as King delves into the perverse and dark heart of humanity. On Writing: A Memoir of the Craft is not just for aspiring writers or Stephen King fans. I'm neither, but I was completely entertained by On Writing. 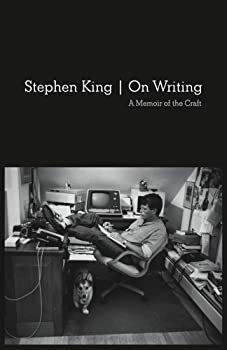 The first half of the book is Stephen King's autobiography of his first 50 years of life. He talks about his family, his childhood adventures with his brother, his relationship with his wife, some of the inspiration and research for his stories, how his alcohol and drug abuse affected his writing, and his accident with the van in 1999. This was interesting, informative, and very funny in parts. 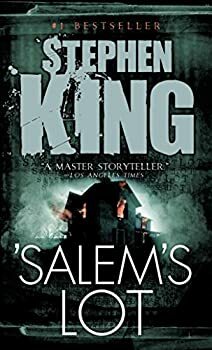 I listened to On Writing in audio format and it was read by Stephen King himself, which added poignancy to the narration. Stephen King tends to get hammered in the press and by literati. He’s pulp, they say. He’s popular, they say. Nobody can be as productive (he publishes an average of two books per year) and still write quality, they say. I remember starting college in Boston in 1988, shortly after U2 released their huge Joshua Tree album. The established U2 fans rejected it outright as a ’sell out'. They couldn’t believe that their heroes sold out to ‘the man’ and became... popular. I think King gets painted with a similar brush. But the truth is, much of his writing resonates quite deeply. His work can be touching. It’s relatable, and has as much symbolism and depth as one chooses to see. Is everything he touches great? No. But as a rule, is it schlock? Absolutely not. 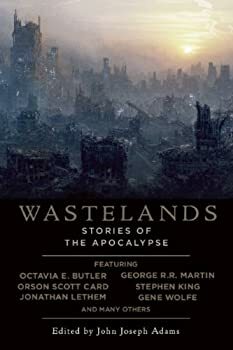 In The Stand, Stephen King basically wrote the book on contemporary post-apocalyptic settings. However, one of the few things that 1000+ page novel missed was zombies. 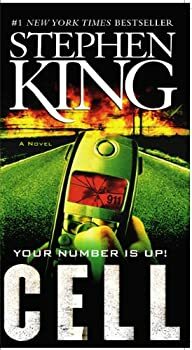 King corrects that omission in Cell, a novel in which cell phones turn users into zombies. Unlike in The Stand, King wastes no time assembling his heroes. Clayton Riddell, who is, of course, from Maine, writes graphic novels. 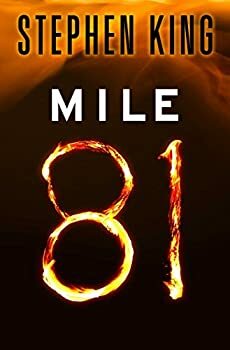 Clay barely has a moment to enjoy his first big break in publishing before the world is ending after the “pulse.” Amidst the ruin, Clay meets Tom McCourt and Alice Maxwell, and they flee Boston together. Under the Dome opens in Chester’s Mill, a small Maine town which is suddenly and inexplicably cut off from the rest of the world by a dome. It’s kind of like a humongous semi-permeable upside-down petri dish, which is fitting, because Under the Dome plays out like a kind of human experiment: what happens when a small town of people is completely cut off from the rest of society and left to their own devices? 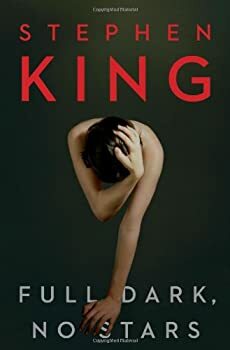 In Full Dark, No Stars, the latest short story collection from Stephen King, our heroes explore the boundaries between victim and predator, often exchanging roles as they navigate their way through the twisted passages of King’s mind. These characters are often out for no one but themselves, and they will use every resource — even burlap sacks and GPS — in their quest to get what they want. Of the four stories, “Big Driver” stands out as Tess, a mystery novelist, is brutally raped and sets out for revenge. Tess fears that she will make headlines, becoming forever the writer that was raped, and she worries that people will see her pretty face and say she was asking for it. Just as she decides not to go public, Tess begins to take comfort in her pistol. And of course King knows exactly where to take a story from there. One of the best things about e-books is that many more novella-length works get stand-alone publication. You don’t have to search them out in magazines, or wait for the author to write several of them and combine them in a collection, or spend a large chunk of change for a special printing from a small press. 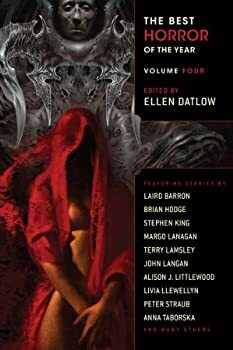 As I’ve always thought that the novella was the form best suited for short science fiction, I’m pleased with this advance; it almost makes up for not being able to hold a real book in my hands, turning real pages. 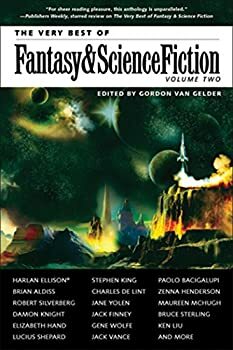 I read the first volume (The Very Best of Fantasy & Science Fiction: Sixtieth Anniversary Anthology, published 2009) before I tackled this one, published in 2014. It's only been five years, but I detected a darkening of the tone. 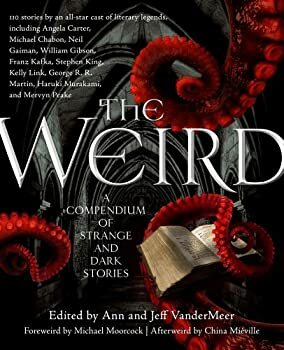 Maybe I'm imagining it, maybe it's just me, but it seemed to me that the earlier volume contained stories that set out to go to strange places and, as a consequence, were sometimes disturbing, while this one contained stories that set out to be disturbing. Revival is a very modern Stephen King novel that channels H.P. Lovecraft at his cyclopean best. His key characters are bold, if not as colorful as some of his best work, and his themes are of familiar and well-trodden King territory. 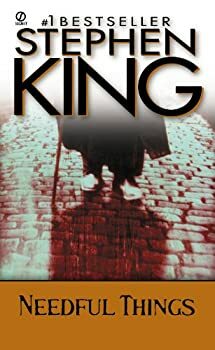 Often hammered by critics (professional and amateur alike) for his weak endings, King builds up to a conclusion that is strong and memorable. It’s monstrous, dark and creepy as hell. It’s pure Lovecraft and beautiful in its austerity. 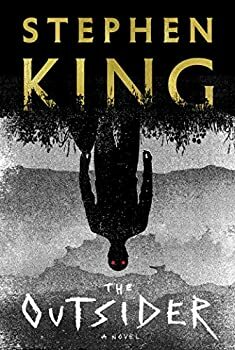 The Outsider (2018) by Stephen King is a big book with a big, layered story. With great effort I’m going to hold my review to one or two aspects of it. First things first; it’s horror, with its roots in King’s classic horror works but with a sensibility influenced by the modern world. It’s good. 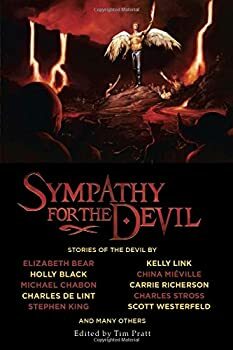 Horror readers will love it and be creeped out by it, but non-horror readers will find plenty that is thought-provoking (and they’ll be creeped out by it). Of course I’m recommending it. Granta strikes me as an unusual place to find horror fiction; it normally is home to the toniest of literary fiction. But Issue 117 is entitled “Horror,” so I thought I’d see what a literary magazine’s vision of this genre is. No, it's not a horrible magazine; it's a horror magazine, and a fine one at that. It's only the Monday that's horrible. 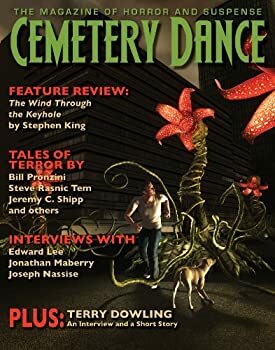 Cemetery Dance is published irregularly, usually three to four issues per year, and covers the entire field of horror, from film to comics to novels. It is heavy on the nonfiction, with excellent reviews and multiple interviews. There are six stories in this issue, all of them excellent. Issue 66 impressed me so much that I’ve already ordered the next, and am likely to subscribe. The first story, “Lines” by Bill Pronzini, is a surreal tale of Hood, who is looking for the woman who left him for another man, taking $2000 of Hood’s money with her. He has tracked her easily, and catches up with her in Line, Nevada. He intends to kill her and her lover, and he does. It’s what happens after that that makes this story Weird. 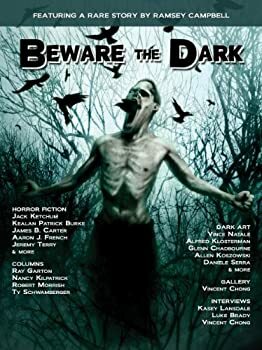 Beware the Dark is a new horror and dark art magazine currently scheduled to be published three times per year. A new horror magazine is always good news, as there seems to be much more horror being written than there are outlets in which to publish it (which explains why Beware the Dark is presently closed to submissions). This magazine suggests, however, that the reason there are so few outlets is that there is little good horror being written. I’m hoping that further editions of the magazine improve on the first, which was disappointing. It must be difficult to write a biography of someone who is still living, who has not donated his papers to a library where one can get access to them, who is still active in his career, and who has a healthy sense of privacy. Even when the subject agrees to an interview, a biographer has to be aware that the subject is telling what he wants to tell and leaving out that which he does not care to discuss. If the interviewee is sufficiently charming, or is completely forthright on a particular subject that casts him in a poor light, the interviewer can easily lose sight of questions not asked. And when the subject has himself written a book or two about his past, you have to wonder just what you can come up with that’s new and interesting.